Do you have a wheelchair which is not being used in your house, facility or hospital? We know a person who would love to have it! When you have unused wheelchairs, please contact us by our contact form, or by email, phone, fax or mail. We will ask you about the condition, type and color of　the wheelchairs and how many you have. (There are cases when we cannot accept some depending on their condition.) We do not accept battery-assisted wheelchairs. Our staff will go to meet you in order to pick it up. Or you can bring it to our office if you wish. 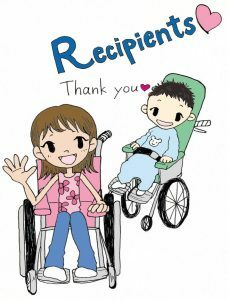 When we choose a recipient, the wheelchair will be carried by a traveler going abroad and flown to the recipient’s country. After that, you will get a photo of the recipient and your chair.